Thanks for donators! You help to keep this site online. In Feb. 11, 2011, and March 3, 2018 I updated my server package to have more room and higher traffic possibilities. “Bloodsport” is a 9 page storyof unknown origin. Mr. Corben sold his original art plates of the story on his site in an auction June 24, 2014. Unpublished. “Sins of Father” (11 pgs). Story by Bruce Jones. Unpublished. Tales of Mystery and Imagination is also a book not out on a market but according the interview with Scott Allie, that book will prob. never do. Unpublished. Available only from CorbencomicartCom/Sales: Odds and Ends (2009). 32 pgs. 7″x10.5″. Incl. in B&W the second chapter of “From the Pit”, book and CD covers and more. 2009: Spectrum Grand Master: Winner! Heavy Metal #295 (2019). “Murky World [II]!”, part 8(15). Heavy Metal #294 (2019). “Murky World [II]!”, part 7(15). Creeps #20 (Oct. 2019). Cover art. Heavy Metal #293 (2019). “Murky World [II]!”, part 6(15). Available from Like [FIN]: Cage [FIN] (2017). 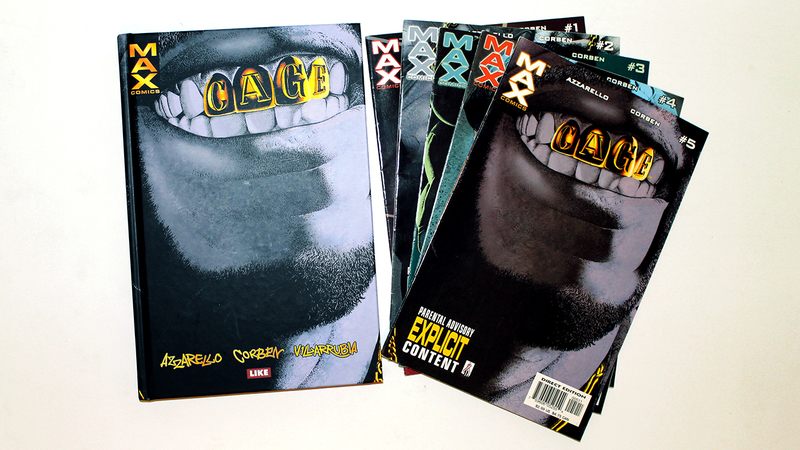 Reprints of Max Comics: Cage #1 to #5 (2002). • Review: Cage [FIN] (2017). 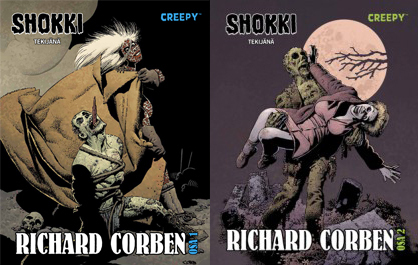 Available from Egmont-kustannus [FIN]: Shokki [II] tekijänä Richard Corben #1 (Sept. 2013) and #2 (March 2014). Reprints of Creepy Presents Richard Corben (2012). • Reviews: volume 1 and volume 2! Heavy Metal #292 (Dec. 2018). “Murky World [II]!”, part 5(15). Heavy Metal #291 (Sept. 2018). “Murky World [II]!”, part 4(15). Heavy Metal #290 (June 2018). “Murky World [II]!”, part 3(15). Creeps #13 (Spring 2018). Cover art. Heavy Metal #289 (Dec. 2017). “Murky World [II]!”, part 2(15). W.B. Dubay’s The Rook Archives Vol 3 HD (Nov. 1, 2017). Front Cover: Richard Corben. Heavy Metal #288 (Oct. 2017). “Murky World [II]!”, part 1(15). Till year 2020. Shadows on the Grave #8 (Sept. 13, 2017). Final issue. Story/Art/Covers: Richard Corben. The Creeps #10 (April 2017). “Fair Trade” by Richard Corben. Shadows on the Grave #1 (Dec. 14, 2016). Story/Art/Covers: Richard Corben. 8 issues long! Rumble #13 (Aug. 17, 2016). Image Comics. John Arcudi, James Harren. B cover by Richard Corben and Reed. The Creeps #7 (July 27, 2016). “The Frankenstein Monster”. Creepy Comics #24 (June 22, 2016). B&W. 40 pgs. $3.99. Story: Dan Braun. Art: Richard Corben. Last issue! Serenity: Firefly Class of 03-K64, Free Comic Book Day 2016 (May 7, 2016) Mike Mignola, Richard Corben. A short story. Corben Index, Book 3: Das Den-Universum (The Den Universe, Dec. 14, 2015). Incl. artiles about the Den Universe. Rat God [HB] (Oct. 14, 2015. Dark Horse). Rat God #5 (June 3, 2015. Dark Horse). Rat God #4 (May 6, 2015. Dark Horse). Rat God #3 (April 1, 2015. Dark Horse). Rat God #2 (March 4, 2015. Dark Horse). CorbencomicartCom (Dec. 3, 2014) The NEW official Richard Corben web site. Buffy the Vampire Slayer Season 10 #8 (Oct. 22, 2014). Christos Gage(story), Rebekah Isaacs (art), Richard Corben (art for a three page flashback). Edgar Allan Poe’s Spirits of the Dead (Oct. 14, 2014).HardBound. Cover plus all stories by Richard Corben. Dark Horse Horror Sampler (Aug. 18, 2014). A free sampler magazine, also a digital version. 124 pgs. Color. Searchers after Horror: New Tales of the Weird and Fantastic (June 2014). Edited by S.T. Joshi. Cover by Richard Corben. Edgar Allan Poe’s Morella and the Murders in the Rue Morgue (June 11, 2014). Cover and both stories by Richard Corben. Corben Index, Book 2: Die grossen Epen (The Great Epics, April 22, 2014) incl. the full feature stories with comments. Jelovnik #3: Leglo strave (April 22, 2014, Serbia). Reprints Haunt of horror: Lovecraft 1-3 (2008). B&W. Edgar Allan Poe’s The Premature Burial (April 2, 2014). Cover and all stories. B.P.R.D. Hell on Earth #116 (Feb. 19, 2014). Variant cover. CFA-APA #91 (Dec. 2013): The Art of Richard Corben. All covers by Corben. Edgar Allan Poe’s The Raven and the Red Death (one-shot) (October 30, 2013). Cover and all stories. Dark Horse Presents #29 (Oct. 23, 2013). “Alone” by Edgar Allan Poe adaptation. The CBLDF Liberty Annual 2013 (Oct. 2, 2013). Image. 48 pgs. Richard Corben tells a metafictional story about a cartoonist bringing back a well endowed hero, not too dissimilar to Corben’s own famous creation, Den. “Dun’s Return”. Dark Horse Presents #28 (Sept. 25, 2013).“The Assignation” by Edgar Allan Poe. 8 pgs. Corben Index, Book 1: Short Story Index (June 2013) by Sebastian F. Otten. Lists all German translated Corben (short) stories with comments. Exclusive interview with Richard Corben. €29,00. 108 pgs. In German language only! Edgar Allan Poe’s The Fall of the House of Usher #2 of 2 (June 19, 2013). A sequel and the cover art. Edgar Allan Poe’s The Fall of the House of Usher #1 of 2 (May 15, 2013). A story and the cover art. Creepy Comics #12 (May 08, 2013). A story and the cover art. Edgar Allan Poe’s Conqueror Worm (one-shot, Nov. 21, 2012) by Dark Horse. Richard Corben. 32 pgs. Color. Dark Horse Presents [vol. 3] #18 (November 21, 2012) by Dark Horse. Richard Corben adapt. Edgar Allan Poe. “Shadow [II]” (8 pgs). Dark Horse Presents [vol. 3] #17 (October 24, 2012) by Dark Horse. Richard Corben adapt. Edgar Allan Poe. “Sleeper [II]” (8 pgs). Creepy Comics #10 (October 3, 2012). With John Arcudi. Dark Horse Presents [vol. 3] #16 (Sept. 19, 2012) by Dark Horse. Richard Corben adapt. Edgar Allan Poe. “Berenice [II]” (8 pgs). Creepy Presents Richard Corben (July 18, 2012) by Dark Horse. 320 pgs. All Creepy/Eerie stories. Plus a new cover art. HC. Creepy Comics #9 (July 11, 2012). B&W classic, “In Deep”. Ragemoor #4 (June 20, 2012) by Dark Horse. Vampirella Archieves #5 (June 2012) by Dynamite. Reprints restored “As Though They Were Living!”, “The Woodlik Inheritance!”, “Top to Bottom”, and some of color works by Richard Corben. Ragemoor #3 (May 23, 2012) by Dark Horse. Creepy Comics #8 (April 24, 2012). With Jeff Parker, Doug Moench, Rick Geary, Colleen Coover, Kelly Jones, and Richard Corben. Cover by Richard Corben. Ragemoor #2 (April 18, 2012) by Dark Horse. Ragemoor #1 (March 21, 2012) by Dark Horse. A continous story. Dark Horse Presents [vol. 3] #9 (Feb. 22, 2012) by Dark Horse. A color Edgar Allan Poe story, “The City in the Sea” (8 pgs). Murky World #1 (Feb. 8, 2012) by Dark Horse. B&W. One shot. Men of War: “Last Measure” (Feb. 1, 2012) by DC. Story by John Arcudi (8 pgs). Creepy Archives Volume #12 (Jan. 25, 2012). “Lycanklutz” by Richard Corben, restored with piety by José Villarrubia. Hellboy: House of the Living Dead (Nov. 2011) by Dark Horse. One-shot. Famous Monsters of Filmland #257 (Aug. 24, 2011) by IDW. Cover. Dark Horse Presents [vol. 3] #3 (Aug. 24, 2011) by Dark Horse. B&W own story, “Murky World”, Part 3. Dark Horse Presents [vol. 3] #2 (June 22, 2011) by Dark Horse. B&W own story, “Murky World”, Part 2. Hellboy: Being Human (May 2011) by Dark Horse. One-shot. Dark Horse Presents [vol. 3] #1 (April 20, 2011) by Dark Horse. B&W own story, “Murky World”, Part 1. Hellboy: Double Feature Of Evil (Nov. 17, 2010) by Dark Horse. One-shot. Two short stories in one, a real double feature. The Spirit: Moon Wolf (Oct. 20, 2010) by DC. Creator: Will Eisner. Story: Jan Strand. 8 pgs. B&W. Famous Monsters of Filmland #251 (July, 2010) by IDW. Cover. Buzzard #1 (June 9, 2010) by Dark Horse. Hellboy in Mexico (Or, a Drunken Blur) (May 5, 2010) aka Hellboy: Camazotz by Dark Horse. Cavewoman Alternative Cover (Aprils Fool 2010) by Image Comics/Frank Cho. Hellboy: The Bride of Hell (Dec. 23, 2009) by Dark Horse. Odds and Ends (2009) by Fantagor Press. Starr the Slyer #1 (Sept. 2, 2009), #2 (Oct. 7), #3 (Nov. 3), #4 (Dec. 2) by MAX. Written by Daniel Way; Art/Cover by Richard Corben; Color by José Villarrubia. House of Mystery #16 (Aug. 5, 2009) by Vertigo. Written by Matthew Sturges and Bill Willingham; Art by Luca Rossi and Richard Corben (10 pager, Hellblazer); Cover by Esao Andrews. Conan 7: Cimmeria (TB: May 20, 2009; HB: May 27, 2009) by Dark Horse. Conan the Cimmerian #1 (July 16, 2008) , #2 (Aug. 13), #3 (Sept. 17), #4 (Oct. 15), #5 (Nov. 19), #6 (Dec. 17) and #7 (Jan. 21, 2009) by Dark Horse. Ghost Rider #30: Villain Variant [Cover!] (Dec. 17, 2008) by Marvel. Cable #7: Zombie Variant [Cover!] (Oct. 1, 2008) by Marvel. Pay attention, colors by José Villarrubia (wrong info on Marvel web site!). Unknown Soldier #1 [Variant Cover!] (Oct. 22, 2008) by DC Vertigo. Colors by José Villarrubia. Hellboy: The Crooked Man #1 (July 2), #2 (Aug. 13) and #3 (Sept. 24) by Dark Horse. Story by Mike Mignola. Art/Cover by Richard Corben. Haunt of Horror: Lovecraft #1 (June 4), #2 (July 30) and #3 (Aug. 27, 2008) All by Richard Corben. Harlan Ellison’s Dream Corridor Vol. 2 (2007). Includes a rare 1990 never before published14 pg story “The Man on the Juice Wagon”, based on Harlan Ellison story under the same name. Aliens/Predator Panel to Panel [TP] (June 2006) Inc. various, among others Richard Corben. The Fantastic Worlds Of Clark Ashton Smith (2005) Edited by James Van Hise. Toe Tags (DC 2004/2005). Story by George Romero. Art OUGHT TO BE by Richard Corben, but was instead by Tommy Castillo and Rodney Ramos. Covers by Berni Wrightson. The Offical web site of Richard Corben: www.corbencomicart.com The Official Corben Studios site was founded in Nov. 10, 1998. Mine was already up in the air (prob. starting from Aug. 27, 1997).